Believe it or not, it's been cold in California the last week or so, so we decided to bundle Capo up! Merry Christmas everyone. We pray blessings on you all, and miss you dearly! Christmas, quite possibly one of my favorite times of year, is here again! Of course, this year it's quite different since we are in California. This will be my first Christmas away from my family. I've never not been with my parents, sister, and her family on Christmas - or the week after. We normally go on a vacation the week after to the beach. So, I'll definitely be missing it this year, but we are also excited about starting some new family traditions here, and continuing with some of our old ones that we have always done - just in a new state! :) We went and got our first Californian Noble Fir Christmas tree. It smells incredible, and I quite like it! Now, decorating the tree has always been a huge family tradition on the Woods side - eggnog, Christmas music, appetizers, the whole family, turn off the lights accept for the Christmas tree lights, maybe have a movie on in the background. I always remember it as such a fun time growing up - I especially liked to dance to the Christmas music! :) Archie and I have continued this tradition, and always made it a really fun event. Even though we just go to Lowe's to pick out the tree (we went to a tree farm with a real horse drawn carriage in the snow in Omaha growing up), it is still so much fun!!! This year was no exception - We went, picked out the tree, took pictures, decorated, sang and danced to Christmas music (I recommend Christmas remixed: Holiday classics re-grooved for something fun to dance to, and Frank Sinatra: A Jolly Christmas - Great stuff) The two workers at Lowe's asked us if this was our first Christmas - HA! I said, no, we'll actually be celebrating FIVE in a few weeks.... Archie said, I hope they'll always say that! 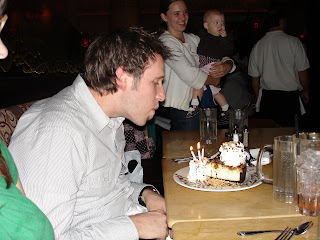 We celebrated Thanksgiving here, and Archie just celebrated his 31st b-day on December 1st. We celebrated by all of us and some new friends going to Cheesecake Factory for his birthday, and all of the families cooked and we went to the Santos' house for Thanksgiving. It was a lot of fun, and overall had a great day! Speaking of celebrations, we will be celebrating our FIVE year anniversary on December 14th! I can't believe we've been married for five years already. It is amazing, and we were saying the other day how each of us have changed so much since we got married, but it is so much a result of the other. I feel so blessed to have married such an amazing man! And to know that we are following in God's direction together makes me feel so great! Christmas tree - sorry it's a little blurry! "Won't it be awesome this Sunday to realize that there are some people whose eternal destiny will change and we get to be a part of that! There is nothing like it! I look forward to watching this vision continue to unfold as we serve together as a team. Please join me in believing God for incredible things this weekend. He is capable of so much more than we can imagine. I can see that so many of you have already signed up for 30 minutes slots on the prayer chain. If you have yet to do so please find a slot and pray for 30 minutes between Friday morning and Sunday morning. I will be praying for you as you invite your friends and get the word out about Sunday. I believe we are going to continue to build momentum and see God do even greater things in our midst." Click on calendar link at the top of the screen. Love you guys and can't wait to share the amazing things God has done here this weekend! We'll update with any other news this week also! Wow we have been pretty slack in quite possibly the most exciting time of journey here, sorry! 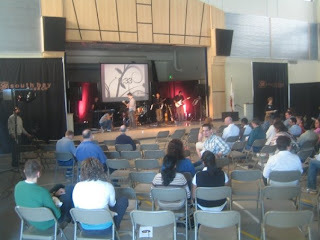 Last week we had our very first public worship service for our new church. We sent out 32 thousand mail pieces to homes in the area. We had a mission team come into town from Texas and they spent 2 days going around the community putting door hangers on doors to invite people to our service. We all put countless hours into our preparation. We flew most of our band and sound guy in from South Carolina. We had a local church give us almost 50 volunteers to come and help us serve and it was amazing! We had 175 people show up! And 5 people give their lives to Christ for the first time! That is really amazing for Northern California. I (Archie) was so proud to have been used by God in such an exciting way. We are meeting at an Elementary school in the area so we have to set up and tear down every time we meet. That morning we started loading in everything at 7am for our 10:30 service and we still ran out of time for a few things, but nothing major. It is just one of those things that will get better and faster every time we do it. 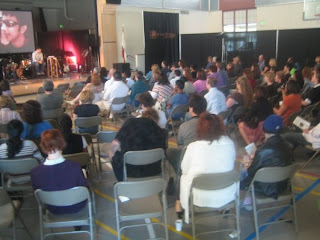 When I got up on stage to lead worship I and I said "Welcome to South Bay Church!" a cheer went up from the whole place, it was very exciting. Worship went well and people connected to the songs but for me it didn't feel like home yet. I felt like I was just leading worship at someone else's church. That morning from 7 right up till 10:30 I was busy unloading and directing people to plug things in and move this here and that there, I really didn't have time to process it all because I had been so busy making sure that this whole thing was going to come off :) I was in charge of buying all the equipment! So I was looking at this thing from a very different way than everyone else. Like did I buy enough extension cords (by the way, I didn't) It wasn't until I sat down after worship to listen to Andy speak that it hit me. A great sense of accomplishment and joy came over me as I looked around the room at all the people that had come that we didn't know, we've only been here 10 weeks, and curtains surrounding the room, and the cool stage, and Andy up there speaking and my guitars on stage, and all the sacrifice that we had made to come here- It hit me- this is our church! This is what we came here for! This is our church! It was amazing to be in that room and to feel God and all the potential that He has for this place. The thought even hit me on sunday, "we are going to quickly outgrow this place! Because our first church service went so well we have been getting calls and emails from all over the country from other church planters wanting to know how we did it and what steps we took to get there. We have taken a statement from a popular author and made it our own. "Work like it depends on you and pray like it depends on God." We followed some strategies, read books, worked very hard, and asked a lot of questions to a lot of wise men but at the end of the day God is the one who blessed us. If I can quote another book we're reading called Go Big, it's kind of the christian version of From Good to Great, It says that "God will give you all you need and more if make it about His kingdom and not about you." I can honestly say that this is the heart of our team. To make it about His kingdom. Don't get me wrong, we were really jazzed about having 125 people from the community come, but there are 7 million people in the bay area and 95% of them don't know Christ. We still have a lot of work to do. I pray that we never allow it to be about us or about our comfort as a church. One really cool thing that we did as a new church that I was really proud of was that we received about $2000 in our first offering and we as a church decided to give it all away. We are giving half to serve those that serve our community like, the police, fire fighters etc. and the other half went to some organizations that help the needy in our community. That felt great to say to the world and to our community and the people who came into our church with a wary eye toward Christianity to say "Christ came to serve and not be served and we are here do to the same." We will have some professional photos of our first service up soon, we haven't gotten them back yet. But here are a few to give you an idea. These are right before the service started. You can see me up on stage, and Bekah on the keys to the left, Marion from Charleston playing Bass,my brother Sam is hidden behind me on drums and Filipe is bending down tucking something under the carpet at the last minute with 33 secs left before the start of service- see I told you it was close! On a more personal note, I have lost 12 lbs by running and switching to diet drinks and splenda in my coffee instead of sugar,and I have started recording some original music on my new computer (nothing to show yet but hopefully soon) Bekah is also lookin' skinny these days and liking her new job working with families in their homes. We are missing family and friends a lot. Thank you to those of you who ask about us and pray for us. We love you and cannot thank you enough for believing in us and for your prayers. Sorry for the break between updates! We'll post a longer one soon - lots of good things to update on! :) Just wanted to post real quickly and ask for your prayers. We are having our first Preview Service exactly one week from today!!!! We are so excited... lots of preparation, prayer, and energy has gone into this event - and it's been something all three families have been envisioning since the beginning stages of this - even before moving to California! Please pray this week during your prayer times. We are praying for the people we have met to come, the time of worship to portray who we are as a church as well as for people to connect with God, and lastly for those who come to have a welcoming experience and see this as their home. We are sending out 30,000 mailers to the community this week, and they are top notch! Very professional looking. We are very excited to see what God is going to do. If you are interested in becoming a part of our prayer team, this weekend we will be conducting a 48 hour prayer! I will post the link at the bottom of the google calendar, where you can sign up for a 30 minute block of time to commit to pray for this first preview service. How powerful to know that leading up to our event there have been people praying for 48 hours straight! Please consider being a part of this - if nothing else, the East Coasters can take the 6am - 9am times and save us from getting up at three in the morning!!!! ;) We are also having our launch team here pray! Thanks again. P.S. the picture is the sermon picture that will be on the mailer and the topic of Andy's message the first meeting. Anybody watch the new show 11th Hour??? It was my first time seeing it, and I only watched it because of the preview, but our new home was featured. San Jose, Cupertino, and Palo Alto were all spotted in the show. The mountains, vineyards, and everything. Thought it was kind of cool! :) The show is sort of like CSI, and it was actually pretty good! Little baby birdies! they flew away too. Today is Stacie's birthday! Just wanted to wish her a very happy birthday and a wonderful year full of blessings! This morning, Mandy and I surprised her while she was at Starbucks and took her a giant card. Then we were able to spend some girl time just chatting. It was really nice. Then all the families went to Macaroni Grill to celebrate! We had a wonderful time and it was so great to celebrate her! I made a giant chocolate cake since she likes chocolate, and it was really yummy! Me with the giant cake! What a fun week! It has been so busy here. You can tell we have begun a new phase in being here, because we are really beginning to get busy. This week has been filled with meeting new friends and neighbors, continuing to explore our area more, and visiting with good friends! We are continuing to build our launch team and our meetings on Sunday nights have been good. We usually have about 20 adults coming, which is a great start! We are so excited to continue to see that number grow as we continue with launch meetings, meet people who are interested, and begin preview services in FOUR WEEKS! That's so crazy. The launch meetings on Sunday night have consisted of Archie leading the group in a few songs, Andy speaking and ministering to the group, and Filipe praying and sharing from his heart a little as well. We have a time of fellowship before and after, and have children playing together in the other room. We are getting used to the quick set up and tear down since we are renting a clubhouse, and we know it's just preparing us for the day when we will be mobile and have an entire church to prepare. We have been having neighborhood lunches on Saturdays. On Tuesday and Thursday nights the three families will go around and invite all our neighbors in one of the apartment complex to a grill out on Saturday. It has been such a great way to meet people. Last Saturday, we had 50 people come!!!! It was so exciting. We were just able to talk and meet with them and get to know each of them and their families! And I think the neighbors liked it also as a way to get to know each other. We had a really fun time. We met people from all different countries including Japan, Canada, Mexico, India, South Korea, and I'm sure others. Everyone had different languages and backgrounds, and it's so neat to listen to them all. I love asking all of them where they work as well - Yahoo, Apple, Cisco systems, it's hilarious. I'm still blown away. I don't feel cool enough to talk with a guy who helped create the I-phone and is currently working on the 5th generation I-phone! :) Here are a few pictures from our last event. Some of our current launch team even came to hang out, which was really exciting. On our day off, all the families went to a town called Half Moon Bay. It's a gorgeous little city about 45 minutes away right on the coast. We went to a pumpkin patch and took the kids. This is really my excuse to go to pumpkin patches. I love fall, corn mazes, hayrides, haunted houses, passing out Halloween candy, pumpkins, fall decorations, leaving the windows open when it's chilly, bonfires - you know, the whole bit. So every year I force Archie to take me to a pumpkin patch so we can go through the corn maze, pick out a pumpkin, and all that fun jazz - but I usually take my nephews so they have fun and I don't look like a giant crazy woman for loving the pumpkin patch as much as I do. Unfortunately, my nephews aren't here :(, but we went with all the families, so their kids were here and I could jump around like a kid. :) we had so much fun. I love watching the kids have so much fun too. They are so cute. We received a wonderful gift from our friends back in Charleston before we left and it arrived this week! A Nintendo Wii!!!! How cool is that! We are so excited, and we have already scheduled a Wii party with some of our new friends. Thank you so much guys! We created our Wii mii's to look like us, so here they are! I think they are hilarious. Over the weekend, Archie and I drove to visit some good friends! Tron and Katie live in Modesto about 1 1/2 hours away. We had so much fun! Those two make me laugh more than anyone I know, and a time with them is guaranteed to produce hours of laughter. It was so good to see good friends who know you and understand you! It reminds you of home for a little bit. They are also from Charleston and so understand missing it. On Sunday, they did the nicest thing ever and made us a BBQ lunch with ribs and yes, STICKY FINGERS SAUCE!!!! Talk about delicious. It was so good. Thanks Tron. We played some Wii with them and had so much fun, and even got Nani, Tron's grandma in on the action. You will definitely enjoy the action here. Lastly, we got to visit with a friend from Charleston who was in town for the weekend. Jason played with us in the band at Crosstowne. We were able to meet up for a few hours and it was good to see him. It was so surreal seeing someone from Charleston here though. It didn't feel right. I mean, we are always going down the road, seeing a car we recognize and saying, "Oh, there's so and so... oh wait, they wouldn't be here!" :) Then, when we really saw someone from Charleston, it was so weird! It was still good to see him. Hopefully it won't be so long between our next post! We promise we'll update again soon! :) Love you all! So some people may or may not know that I (Rebekah) am obsessed with the weather. I love to watch what it is going to do, especially if there is a storm, in order to see why it's being caused. I've even been known to have friends call me to see where a particular storm is moving, because she knew I would know. HA. We've already mentioned how the weather here in Santa Clara, California is different. I just thought this was over the top. It's a warning that basically it's going to rain. I mean, sure it also warns of some wind and stuff. But the major point of this warning was to say that there hasn't been any rain since Spring and so the road may be slick, clear your gutters, etc. HA! Can you imagine in Charleston if they were to post some kind of warning like that. They would have to do it every day with those afternoon showers. I just got a kick out of that. If you think about it, say a little prayer for me today at 2:30 Pacific time, I have a job interview. Trying not to get my hopes up about anything just yet. We have had a very busy week full of ministry stuff, but it is feeling very good. Tonight we the three girls are getting together with any girls from our previous Sunday night meeting who wanted to come get coffee at Peete's (it's a local coffee shop comparable to Starbucks - pretty good). It will be nice to get to talk to some of them and get to know them a little more! So, we finally became official residents of California. It took us 4 1/2 hours at the DMV, a vehicle verification and smog test, and taking the California driver's test but we can finally call ourselves Californians. At least that's what the license plates and driver's license say. We had a miracle take place on the way there! We have had a check engine light that has been on for several months, had it fixed several times, and keeps coming back on. We could never figure out what is causing it. We were going to go get it looked at again before going, because in California, you can't pass the vehicle verification and smog test if you have a check engine light on. When we turned the car on to leave - NO LIGHT!!!! It turned off by itself - which it has NEVER done, and has not come back on since. We were amazed! God is good, huh! But, back to the DMV, let's just say that the DMV system in California is no different than in South Carolina. It was a long wait in several lines, and I CAN'T BELIEVE they made us take a written driver's test. It was HARD! I hope none of you ever have to do this... and if you do, make sure you know what the legal blood alcohol level is, how old and how heavy you have to be to ride in the front seat, when you can turn in a bike lane, rail road crossing signs, etc. Just be prepared! whew. It is really weird to see the California license plates on the car, and we had a small ceremony of sorts, because in here you have to have front and back plates (in South Carolina, you only needed back) and I had a fun license plates that said something along the lines of Carolina Girls being the best in the world that had to be removed. Archie was sure glad, but I am going to miss it. On Saturday, we went on a date to Santa Cruz. It is a small beach town about 30 minutes away that you have to cross through the mountains to get to, but it is really fun. It looks like an old movie. It has an amusement park on a boardwalk right up to the beach, and mountains surrounding it, and boasts to be one of the top 5 places to surf in the world. There were a lot of surfers out that day. The homes in the area were really cute, very cottageish and everyone rode big beach bikes around. We took Capo with us and just went for a walk on the boardwalk. It was a nice change in pace to having things to do and such. Here are a few pictures. On Sunday, we held our first Launch team meeting. It was here in the apartments, we had it at one of the clubhouses. We prepared for it all week, and were praying for 20 people to attend. We had been inviting people to come for several weeks - some from the church who is supporting us in Fremont, some from meeting them at the Art and Wine festival a few weeks ago, and some just from meeting in the community. As we got ready yesterday, I can't say all of us weren't a little nervous about what kind of turn out, if any, we would have - thinking it might just be us families. :) We were blown away with 29 adults and 8 children!!!! We were so excited. It was a great time of meeting too. We shared dinner together, and were able to talk to everyone, had a time of worship (which Archie led), and then the three guys (Andy, Filipe, and Archie) shared their testimonies of how God had brought them to this place so far. Andy also shared the vision of the church and what we had planned for the next several months, and how each of these people, if they were interested, could become involved in the launch team. What an amazing answer to prayer. It was so exciting to meet people and talk with them and find out how they came and how they want to be a part of what we are doing! Praise God. We are just praying that God would use each of them and speak to them about how they can become involved and that if this is what they are called to, they will join us for such a time as this! Just wanted to update quickly also, that Andy met with the vice principal from the school that we asked everyone to pray for, and he sounded very positive about us meeting there. He made it sound like if there was nothing on the calendar, than there would be no problem. We are still waiting final approval from the application process, but it sounds very very promising! - Our first launch team meeting this Sunday after sharing the vision with everyone and asking them to commit. Pray that everyone who came last night will come back and we would have an even bigger crowd this week. - Pray for the friendships we are making, that God would be in the midst of them, and allow us to shine His light on every person we come in contact with. We are only human! We want to be God's light to this community. -October 11, we are having a family day in the park for everyone on our launch team, anyone they invite, and we also invited anyone who signed up showing interest in the church from the Art and Wine Festival (about 90 people, 20 of those expressed interest in being part of the launch team). Pray that we would have a good crowd, that it would be a good time of fellowship and ministry. We are beginning to finally sort of learn our way around - today, I went to the grocery store and didn't have to use the gps on the way back! :) haha, well in my defense I took a different way to get there (and got lost even with the gps), so it was pretty good that I could remember how to get home from the next city over without any sort of map or anything. This place is huge! There are at least 4 major interstates and several smaller highways and expressways to get through cities. It's hard people! Just a quick update... earlier today I asked for your prayers for a meeting location for South Bay church. Since then, one of our top choices for meeting - a school in the area, has been in contact with Andy, and they have a meeting set up for tomorrow at 8:30 am (Pacific time - so plenty of time in the morning to pray for all you East Coasters) with the Vice Principle of the school. Please be in prayer for this meeting that God would be our guide in this meeting, that He would give Andy the right words to speak, and that He would grant us favor in this meeting! Thanks so much for all of your prayers. We will keep you updated! On Sunday, Archie and I as well as Stacie and Mandy attended a church called Crossroads (whose pastor's name is Paul ;) ) who is going to be a big support for us. They are helping to plant this church with us and even committing to sending volunteers down to be a part of the launch team and helping us out. The church services were great, and we felt so welcome there. They had three services - one Saturday night and two on Sunday, and we attended all three, and were brought up on stage and introduced for all three. It was a good experience for us, and we'll be visiting there a lot over the next couple months. Last night, we had dinner with a couple from here that Archie had met when he came back in February. He stayed with them at their house while he was here and got to know them some. They are such a nice couple and it was a pleasure to get to meet them in person. I'm sure we will get to see them more, but it was also nice to actually have someone to meet with and have dinner with. It felt normal! Archie and I went to this humongous mall in the area the other day. We had no idea quite how large it was until we got there, but it was huge. Let's just say it has all the shops you ever want to go in, some of those specialty shops that you only find when you are like out of town or something, and the best restaurants all in one place. It was amazing! We didn't spend a lot of time there, just sort of walked by all the stores, but it was fun! And we ate at an amazing place! It's one of my favorite places to go, and haven't been to one in years. This is for you mom and dad! This morning, we had our first launch team meeting. It was just the three families this morning, but we got together and planned for our meeting Sunday night which will include everyone who has showed any interest. We have sent out letters, met people personally and invited them, and will follow up with some phone calls later this week. We are very excited and can't wait for the meeting to have planning, vision casting, and get a little better idea where everything will fall in place. We are going to have dinner and a time of worship, then Andy will speak and we're meeting at the apartment clubhouse, so it will feel like a real meeting! That's basically all that's been going on here. It really is an amazing place. We love the mountains surrounding us everywhere, and even just looking out our back patio is filled with a great view. We have an orange orchard right outside. Here are some pictures, of the mountains from a parking lot we were in and some pictures from right outside my back door. Lastly, I promised a video tour of our apartment once it was all put together, it's pretty much there, so here are a few. It's pretty much what the pictures showed the first time, but it does show some more rooms! :) Hope you enjoy. Please be praying for us this next week if you think of it. As we mentioned, we are having our first launch team meeting this Sunday. Please pray that it would be a beneficial time and that the people who come will feel like this is a vision that they would like to be a part of in reaching the lost. We are praying for 20 people! Also, we are in the process of trying to nail down our meeting place for our preview services. We are meeting with people and we would appreciate your prayers as our team meets with officials for favor! Update again soon! 1. Every public bathroom in California has those cool seat covers. Back home in Charleston, you might find one or two bathrooms here or there, but not all. I feel so sanitary here, even if you are using more paper than you should. 3. There is a Montague street here - well actually it's an expressway, but close enough and it makes me think of home when I drive on it. 4. There are NO superwalmarts!! The closest one is 45 minutes away! What am I to do??? :) All of the targets and walmarts are the old kind. Guess I'll have to get used to that too. 5. There are mountains surrounding us on all sides. Everywhere you go you see mountains - except when it's foggy. It's very very pretty. 6. There is such a large international population here. It is really really neat. Even store/business signs have Asian symbols describing what they are. Us, being white are really the minority here. Alot of international people come here for jobs at all the hundreds of technological places surrounding our area - including Canon which we can see from our back porch, Ebay and Cisco systems less than a mile down the road, and Yahoo about 4 miles away. We'll let you know some more as we discover them! of Santa Clara with an annual festival they do called the Art and Wine festival. It's similar to the Flowertown/azalea festival if you are from Charleston. It was great we had about 25 people to help out and we just volunteered in whatever way we could with helping artists/vendors unload their stuff, face painting, crafts, trash pick up, you name it. We also had our own booth where we passed out balloons and gave away starbucks gift packets. We had 90 people sign up over the course of the weekend saying they wanted more information on the church! Help us pray for those people to have softened hearts as we follow through with them in the coming days and weeks. It was a great weekend for meeting people though and getting our name out with a good reputation in the city. We were even asked to come back and help with a Halloween event and Fourth of July event. We're excited. We met a lot of amazing people also, some artists and some of the people who worked for the city were so friendly and helpful - we can't wait to get to know them even more. Here are a few pictures of the event, and one of the whole lakepoint team. Our first morning with Lakepoint, Archie led us in a song before we did some work around the city. Archie helping one of the artists at the festival unload her work, and the Southbay church booth at the festival! Gotta hand it to Filipe, I thought it looked great! Here are a few shots of us working at the festival: Filipe talking with people and Archie and Chris from Lakepoint playing some music, Andy from Lakepoint face painting. We had our first worship service on Sunday morning at the Embassy Suites with the Lakepoint team. Archie was able to lead worship for all of us and Andy spoke for a few minutes. Here is a picture of that. We were very excited for this! We got to take the team (and my mom) to San Francisco city Friday night. We got to see a few of the sights and enjoy some good food and hot chocolate from Ghirardelli chocolate factory. Just stay away from 6th street. It is seriously about a 65-70 degree angle drive up to the top, and we got stopped at a red light at the very top with brakes that are making funny noises!!! my mom and I were sweatin it! We are still trying to learn the city and not rely on GPS so much, and we're even getting a little better. We'll be pros before we know it! Continue to pray for us as we learn our new home and get to meet more and more people.